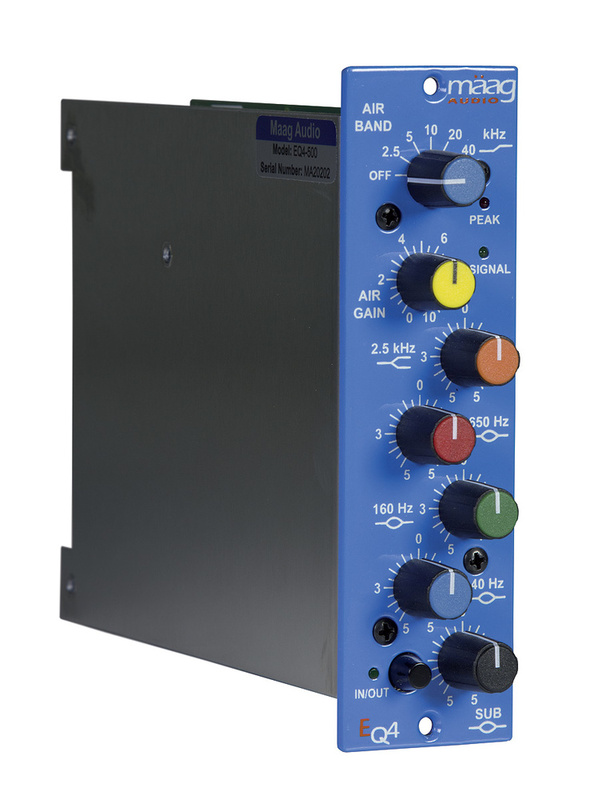 The Mäag EQ4 has developed a reputation for being one of those really useful little EQs that does just what you need in terms of light-touch tonal coloration, making it potentially the perfect partner to a clean-sounding mic pre. One thing that makes the EQ4 unique is that it offers control over the very low and high frequencies: the 'Sub' band is a bell boost/cut fixed at an earth-shatteringly low 10Hz, and the 'Air' band a shelf boost that can be set to 2.5, 5, 10, 20 or a bat-bothering 40 kHz, as well as 'off'. In between these, though, are four more fixed-frequency filters: a 2.5kHz high/low shelf, and 40, 160 and 650Hz bell boost/cuts. Taken together, it's an unusual combination, but it's one that I found extraordinarily useful during my review tests. The Air band in particular, I found myself wanting to use on almost every source, often set at 20 or 40kHz with a generous boost. Those figures may be on and beyond the edge of human perception, but boosting with this filter causes a definite audible difference further down the spectrum. It's a great tool for adding an impression of detail and clarity to the top end of many sounds but in particular, I found, for teasing out the breathiness of vocal parts and adding a gentle lift to cymbals. 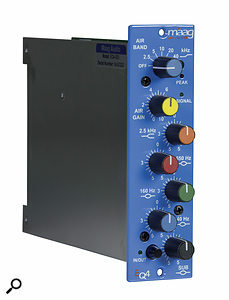 I didn't have a stereo pair, but I'm sure that if you did, and wanted to try the old trick of adding a high-quality top-end boost on the mix bus, so you only need perform subtractive EQ on the console channels, this would do the job very nicely. The 21-position potentiometer for the Air band's gain means you have plenty of control over what you're adding here, too. No-one in their right mind leaves any 10Hz anywhere in their mixes deliberately; it's a headroom-hogging, speaker-ripping part of the spectrum that you can't hear! But if you're working with nice, clean recordings, with all the low-end bumps and rumbles filtered out, you'd be surprised by the degree of subtle coloration that can be achieved by juggling the 10 and 40Hz controls on this EQ. Doing this, I achieved a transformer-like thickening of the lower end of a bass part, that I'd deliberately tracked via a cleanish mic and preamp chain. Again, I could imagine this working well on full programme material, or on a drum bus. The sections between the HF and LF extremes are rather more ordinary, but the frequencies have been well chosen, presumably with vocal processing in mind. That said, the HF boost at 2.5kHz is useful on many sources, particularly those recorded through ribbons or dynamics, where that hint more detail is often desirable in the context of a mix. I compared the hardware unit with the Plugin Alliance model of this EQ, and have to say how impressed I was with the software. It gets about 90 percent of the way towards sounding like the EQ4, and does a better job in the high-end sheen department than all but a couple of plug-ins I can think of. If you can't afford the hardware, I can highly recommend it. But the elusive 10 percent, largely found in the Sub and Air bands, makes the 500-series EQ4 a very special and unique processor. The plug-in sounds a hint more clinical, the outboard just effortless. If I could use one word to sum up the sound of this EQ, it would be 'clarity', which is a strange thing for an EQ designed to colour a signal. I'm given to understand that this is down to Cliff Mäag designing the EQ to introduce very little phase shift. Whatever the reason, it's a lovely sonic paradox to explore with your own ears!